See clearly, drive safely with the Michelin Stealth Hybrid Wiper Blade. 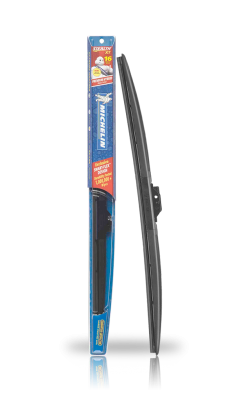 The MICHELIN Stealth Wiper blade is built tough for durable wiping performance in ALL weather! The unique patented design with Smart Flex Technology adapts to the curvature of your windshield for superior wipe performance. The EZ Lok connector system allows for installation in minutes. Durability tested to 1,000,000 wipes! Durability tested to 1,000,000 wipes. Advanced Hybrid design with Smart Flex Technology wipes better. Built Tough for durable wiping in performance in all-weather heavy rain, ice, sleet and snow. Durable soft Cover provides maximum flexibility and protects from clogging with snow and ice. 8046 - Michelin Stealth XT Hybrid Wiper Blade 26" 8039 - Michelin Stealth XT Hybrid Wiper Blade 19"